Sterling Silver, real Turquoise, Coral, Jet, Red Oyster Shell, Brown Shell, along with White and Yellow Mother of Pearl. 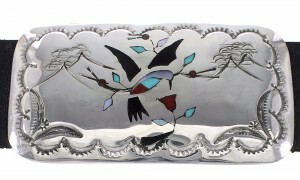 Each concho piece measures approximately 1-5/8" long and 3" wide. 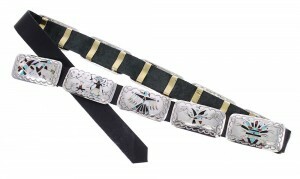 Total belt length measures approximately 47" long and 1-1/4" wide. The belt weighs 353 grams. 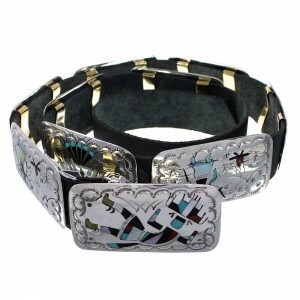 This belt is a beautiful piece of wearable art! 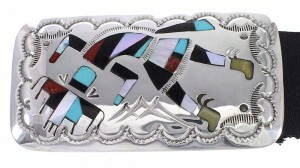 This piece of Native American jewelry is Navajo hand crafted by artist Jane Becenti, out of genuine sterling and real multicolor inlay. 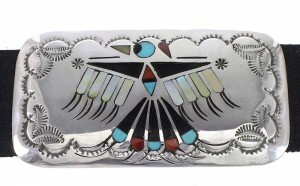 The inlay consists of: Turquoise, Coral, Jet, Red Oyster Shell, Brown Shell, along with White and Yellow Mother of Pearl. 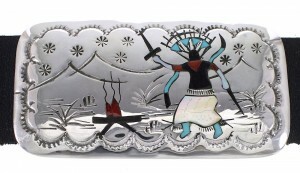 The belt features TEN concho pieces with inlay that is gently set, while creating beautiful Kachina Figure, Hummingbird and Thunderbird designs. 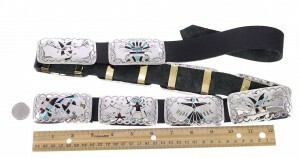 Stamped patterns can be seen completing the belt perfectly. Hummingbirds are mainly known to be defenders of their territory. Many times stronger than their small size would indicate. 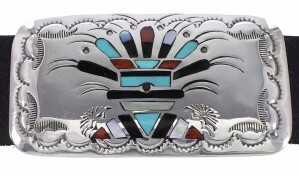 The concho buckles are stamped sterling and hallmarked.